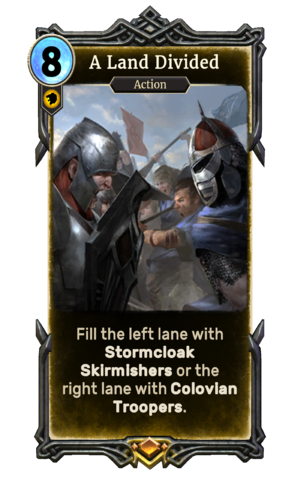 Fill the left lane with Stormcloak Skirmishers or the right lane with Colovian Troopers. A Land Divided is a legendary Willpower action card. It is part of the Heroes of Skyrim expansion. The card's name refers to the Stormcloak Rebellion, which is the focus of Skyrim's Civil War questline. This page was last modified on 11 December 2018, at 00:52.